In November, I sent the Colorful Cousin shawl to Linda B. (Razzle Dazzle Quilter) because I knew that she would like the bright colors. Linda surprised me with a squishy package two weeks before Christmas. 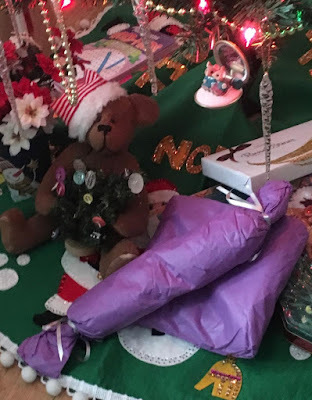 The tissue-wrapped parcels were placed under the tree to open on Christmas Day. 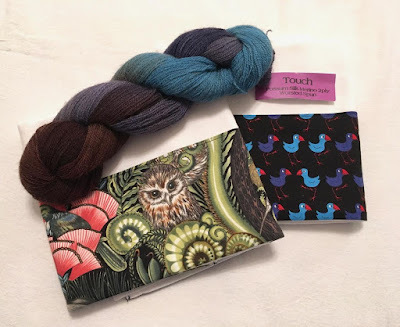 The yarn (TOUCH) is one of the softest I've ever felt, and I know it will be a delight to knit. No doubt, the silk and possum fur will have a lot of drape. Linda told me the owl on the towel is native to New Zealand - a Morepork. The Maori name for the owl is Ruru. She said the European name is better because "morepork" is the sound the owl makes. Linda said, "I used to live in an area where there were quite of few Morepork. When I went to call my cats in at night, the Moreporks would all back to me." Linda, thank you for these exquisite gifts. Such lovely gifts Nancy. I Want that yarn and that colorway! WOWZA. the fuzz factor will be so pretty!! I love your owl story! Wow! Wonderful gifts! The owl fabric is gorgeous on that towel. How exciting to get gifts from so far away! And such lovely gifts they are. Isn't it nice to know that someone thought so much of you? With a blog post starting like that - I wasn't quite sure what I would be reading about! How lovely, you both sent and received such gorgeous gifts. What beautiful gifts! I bet that yarn is just so luxurious. Love the owl (and the story of the name). Those are beautiful gifts. I can only imagine how soft the yarn is and I really like that colorway. Great story about the owl too. You learn something new every day! What lovely gifts. The owl towel is so charming, so is the story. I've heard so many wonderful things about possum or opossum yarn. I've never felt it. I would love to see what you make. Possum yarn is a new concept to me. What a sweet gift! Enjoy! I'm looking forward to seeing what you create with the yarn.